Get away to Chateau Elan for a weekend of wine tasting, championship golf, European-style spa services and delicious food. This vacation resort is one of our picks for best weekend getaways in the U.S.
Find more great weekend getaways from Atlanta. Located on 3,500 acres in the north Georgia foothills, the property is reminiscent of a 16th century French chateau. The resort, surrounded by 200 acres of lush vineyards, features an equestrian show center, a tennis club and a choice of luxury accommodations. The Inn offers 277 deluxe guest rooms and suites, furnished with pastel colors, window shutters and country French furnishings. A visit to the spa is a must on your weekend trip. Golfers can book one of the Chateau Golf Villas, two and three bedroom villas located on the 15th fairway of The Chateau Course. There are two 18-hole championship golf courses, Chateau and Woodlands golf courses. The Golf Academy offers private lessons and group instruction. If you are a beginner, ease into golf on the Par 3, 9-hole walking course adjacent to the inn. Enjoy complimentary daily winery tours and tastings. The 45-minute wine tours begin with a video presentation, tour of the wine making facility, cask room and bottling area, and conclude with wine tasting. While all guests can take the tour, wine tasting is restricted to those older than 21. There are eight restaurants which serve international and regional American dishes. For a classic French meal, visit Le Clos; or try the Carriage House Restaurant, set in a restored 1886 Victorian house; casual bistro style foods are served at Cafe Elan; Versailles serves buffet and a la carte fare. 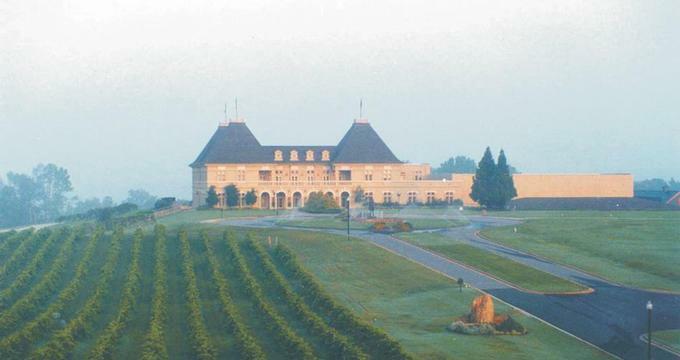 Chateau Elan Winery has been producing quality Georgia wines since its opening in 1985. The setting of the winery, housed in a 16th century style French Chateau, is quite beautiful, making it a romantic day trip or a weekend getaway. The estate has 75 acres of vineyards that produce 22 varietals, including Merlot, Cabernet Sauvignon, Chambourcin, Sangiovese, Pinot Noir, Sauvignon Blanc, Chardonnay and Riesling wines. Tours and tastings are offered daily, except Christmas. Tours last approximately 45 minutes and include a video presentation, a tour of the winemaking facility, and a wine tasting. Advanced booking is not required, but it's a good idea to call ahead and confirm the hours. Private tours of the Winery can also be arranged, such as the Executive Tour or Meet the Winemakers Tour. Advanced booking is required for the private tours. Public self-guided tours are offered Monday – Friday from 11am to 6pm. The self-guided tour is free and wine tasting costs $5. On Saturday & Sunday, tours with a guide start about every hour from 12pm to 4 pm. A tour with a guide and tasting costs $5. For more information and to confirm opening times, call 800-233-WINE, extension 6354. Chateau Elan, a 3,500-acre country estate 40 minutes from Atlanta, offers 63 holes of championship golf. The Chateau Course, designed by Dennis Griffiths, is built on 170 acres with lakes, ponds and thick Bermuda roughs. The Woodlands, also designed by Griffiths, features numerous elevation changes and complements the natural surroundings. There is a Nine Hole Par 3 walking course, situated behind the inn, with small bent grass greens, ideal for families. The Legends Club is a private club with a course where resort guests can play if there is availability. The Academy provides comprehensive practice facilities and private instruction, complete with video and computer technology. The Chateau and The Woodlands courses are open to the public daily. Tee times may be made seven days in advance for public play and 120 days in advance for resort guests. Greens fees start at $65 per person, including cart and range balls; from $45 per person from 2 pm to 5 pm; from $32 per person for twilight golf. During the weekend, regular rates start at $77 per person. The property is located 40 minutes north of Atlanta. Doubles start at $172 per night.